When I first started with NM EPSCoR in 2013, one of my major tasks was to recruit students for our undergraduate research program, the STEM Advancement Program (STEMAP). Three and a half years later, I had traveled over 5,000 miles to visit 22 of 25 primarily undergraduate institutions (see map below). Those miles traveled and campuses visited resulted in 200 students applying for STEMAP from 2014 to 2017. Of the 200 students, 50 were selected to participate in four STEMAP cohorts. 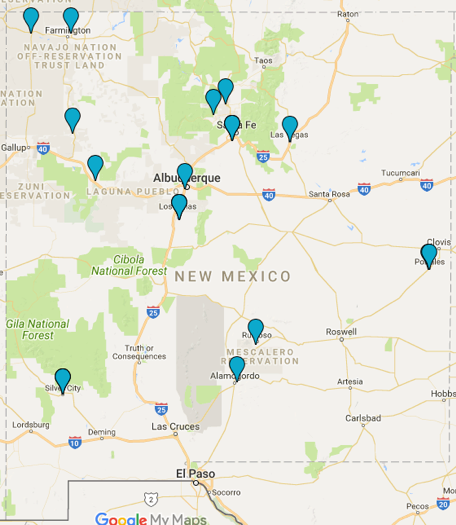 These students are representative of New Mexico in terms of population and region. 92% of the total STEMAP cohorts are female or underrepresented minority and from different parts of the state (see map below). STEMAP’s success is a result of the program design, as well as recruitment and retention strategies. Program benefits – a competitive stipend, 3 credit hours, meal allowance, and housing (including family housing). Student teams – students were paired in teams to work together over the summer. Mentor training for Research faculty and student mentors. We have a great team! STEMAP is coordinated by a team of people who have the students in mind the whole time. Boots on the Ground—In person-recruitment visits and presentations to 88% of the Primarily Undergraduate Institutions in New Mexico. Promotion materials with diversity in mind—flyers, brochures, and webpages have diverse people and research locations so potential students can see themselves in those positions. 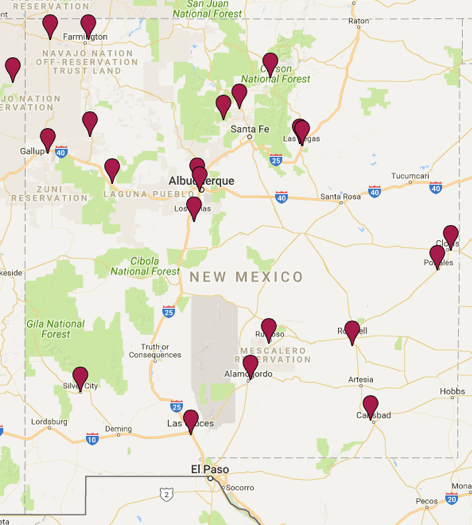 Using networks to promote the program—including our STEMAP alumni and other NM EPSCoR programs. Paid Academic Year Programming—extended research at home institutions or webinars on presentation skills, career planning, and more. Paid conference travel to present research beyond NM EPSCoR. STEMAP was a very successful program from the quality of the students that apply, to the work that the students and our research teams put in together, to the steps that the students take after their summer research to further their STEM education and careers. I am thankful for chance to work with such a great program and excited for the future of STEM in New Mexico!